A short biography of Russian revolutionary anarchist and protagonist of the Ukrainian Makhnovist movement, Peter Arshinov. Exiled to France, he later appeared to split with anarchism, but was killed after re-entering the USSR in 1937 for apparently attempting to organise anarchist groups. Piotr Andrievich Marin (Arshinov) was born in the village of Andreivka in Nisnelomov province, into a family of workers in 1887. He joined the revolutionary movement in 1904. In 1905 he was a fitter in a railway workshop in the town of Kizilarbat, in Turkestan near the Iranian border. He was a member of the Bolshevik section of the Russian Social Democratic Party, and edited the paper Molot (The Hammer) aimed at the rail workers. In 1906, to escape the attention of the police, he fled to Ekaterinoslav. There he drew close to anarchism and joined the movement. He worked there in the Shoduar factory. He organised armed attacks on the representatives of the local authorities and the police. On 22-23 December 1906, with other anarchists he attacked the police headquarters at Nisnedneprovsk. On the 7th March 1907 he shot dead Vasilenko, the boss of the railway workshops of Alexandrovska, in Ekaterinoslav province, in front of a large crowd of workers. This individual had denounced more than 100 workers who had participated in the armed insurrection of December 1905, to the authorities, and some had been shot and the others sentenced to long years in prison. Arrested on 9th March 1907 he was condemned to death by hanging by a military tribunal. In the night of 22nd April 1907, he escaped with other prisoners during an Easter Mass. He took refuge in France. He returned to Russia in 1909, and in autumn was arrested for anarchist propaganda among the workers of Briansk. He escaped from prison again before sentencing, and continued with underground propaganda work among the workers and peasants of Kostrom and Smolensk. In May-July 1910, he took part in an expropriation (robbery) with other anarchists of a wine depot in the village of Filopovo, in Kostrom province, and of a wine depot in Stepanovo-Silino in Smolensk province, in an attack on the town post office in Sudislav I Kostrom province. In August 1910 he went to Austria to procure arms and propaganda. Returning in September he was arrested by the Austrian authorities, imprisoned in Tarnopol and then handed over to the Russian government in May 1911. His trial started on 25th June 1911, under the pseudonym of F. I. Mikhailski, at Moscow with 36 others. In October 1911 he was sentenced to 20 years in prison. He was incarcerated in Butyrki prison. Here he got to know the young Ukrainian anarchist Nestor Makhno. Arshinov had taken some trouble to educate himself, and he passed on his knowledge to Makhno. The latter mentions in particular courses in geography, history and mathematics. He also reinforced Nestor’s political beliefs. Liberated by the Revolution on the 1st March 1917, Piotr became one of the founders of the Federation of Anarchist Groups of Moscow, secretary of the union for propaganda of Moscow, and organiser for the papers Golos Truda and the periodical Anarkhia, from September 1917. He participated in the conference of the anarchist groups of Moscow in June 1918. He took part in the civil war in the Ukraine with the anarchist Makhnovist movement. In 1918 he was editor of the paper Golos Anarkhista in the Donbas basin, and arriving in Gulyai Polye with other Moscow anarchists, was from April 1919 until August 1921 involved in the Makhnovist movement. He was involved in the cultural department of the Makhnovists, helping produce and edit Put k Svobode (Road to Freedom) the paper of the insurgents from 1919. With Voline, he initiated the organising conference of the anarchist groups of Nabat and had a leading role in the political direction of the Makhnovist movement. He was one of the editors of Nabat, the organ of the organisation of the same name and of Golos Makhnovista in Kharkov in 1920. After the crushing of the Makhnovist movement by the Bolsheviks in 1921, he fled across the border. 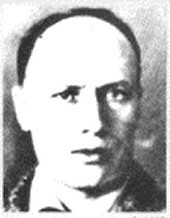 He participated in various Russian/Ukrainian anarchist exile papers,editing Anarkhicheski Vestnik (Anarchist Herald) in Berlin for the Group of Russian Anarchists Abroad in the magazine Dielo Trouda at Paris from 1925-1929 and at Chicago from 1930). He wrote many articles on the Russian situation for that magazine and was one of the authors of the important text the Organisational Platform of the Libertarian Communists. Whilst in exile in Berlin he wrote his celebrated History of the Makhnovist Movement. In 1935 he marked a clear break with anarchism with an article the Fiasco of Anarchism that appeared in the Communist paper Izvestia on the 30th June. He returned to the Soviet Union. There he worked as a proofreader in Moscow. During the purges he was rounded up and accused of attempting “to restoring anarchism into Soviet Russia.” It appears he was shot in 1937 in deportation. American anarchist Alexander Berkman, was equally harsh, writing that “ I don’t consider him important at all...To my mind the betrayal of our cause by such as Yartchuk, Arshinov etc is due to two causes: lack of Anarchist vision and of understanding of Anarchism: and secondly: economic causes. They hope to improve their economic situation by siding with the Bolsheviki, and as a rule they do improve it that way. Well, with such traitors and cowards there should be no further dealings”. Max Nettlau said more or less the same. Camillo Berneri was to remark that Arshinov had not left the movement quietly and with dignity, but had slammed the door behind him like a drunk. Set against this is the record of militancy that speaks for itself and above all, his book on the Makhnovist movement. There is a school of thought that Arshinov deliberately put up his denunciation of anarchism as a smokescreen so that he could return to Russia to help organise the underground anarchist movement there. We do know that the Dielo Trouda group maintained contact with that movement, and Ante Ciliga in the Russian Enigma refers to it as extremely well organised. We cannot be certain, one way or the other, until any records maintained by the Russian authorities are looked at by researchers. We hope that some such researcher will do so soon.